The Black racer, scientifically referred to as “Coluber constrictor priapus”, is also known as “Southern black racer” and it is one of the most common species of Coluber constrictor snakes. This snake is considered to be endemic to the North American regions of United States and Canada. The Black Racer is now found in many parts of Asia and Africa especially in the warm tropical climates. The Black Racer snake is predominantly black in the posterior; it has some proximal spines that enlarge into some basal looks hence the name “priapus”. The snake often appears as a thin structure and has a dorsal side characterized by black colour while the belly appears grey and the chin is white. The average size of the black racer is between 20 and 56 inches or 51 to 142cm. The Black racer matures rapidly, it attains full maturity within 6 weeks and does not feed much frequently. The snake often consumes little and can go for days without eating. The snake is a cold-blooded one and regulates its temperature by showing up in the sun and also hiding under shades. The Black racer has a brief life cycle spanning less than a year. In most cases, several young Black racers are born but few survive to the adult stage. The Black Racer is normally found hiding under shades of trees, leaves and any other warm place. The snakes can successfully hide within a residential area without coming out for several days. The snake is also found close to domesticated poultry and where birds are nesting .Generally, this snake is close to where its prey is located. The snake also prefers to come out when the weather is warm or hot. Black racer snake can consume any animal that it can subdue and these include; frogs, rodents, Lizards and toads. 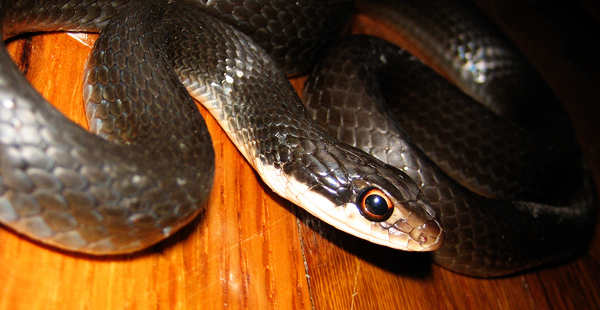 Aside toads, lizards, frogs and rodents, the Black racer can also consume insects, moles, and birds. The Black Racer snake is active during the day, thus it can be sighted easily. The snake is known to charge at people, just to frighten them, but will eventually run when challenged. Though it is not a venomous snake but does not tolerate any form of handling. The snake is known to defecate some foul smelling musk that also serves as a defense against predators. This snake is very fast , thus it is referred to as a “Racer”. The snake is not venomous but tries to crush its victim into the ground and kills it by suffocating it. The snake is so fast that it can easily catch perching and soaring birds . It also has a keen eyesight making its ground awareness very sharp. Go back to the How to get rid of snakes home page.